Among hockey diehards and casual fans, there is probably no single issue that is more divisive than seating. Everyone has an opinion about which seats are best. As a teaching assistant, I once had to lead a group discussion about an article claiming that the best seats were right behind the goalie. Even though that dubious assertion was merely a preamble for the topic at hand, much of the class discussion devolved into an impassioned debate on where "true fans" should sit. Canadians know that the above image has broken up more friendships and marriages than adultery has or ever will. Among seasoned fans, there's a strong consensus regarding 200 level--especially 200 Centre. That's the best place to see the entire ice and, as a result, comprehend the action at both ends of the rink. However, if the game involves a lot of back and forth play, you may experience the sort of repetitive neck strain that is common only to participants in meth-infused marathons of Pong. Seeing the game is important, but sitting away from the action only allows fans to indulge--at best--two of their senses in the action (sight and hearing) depending on the arena. If you're stuck in the Press Level of Scotiabank Saddledome, you're basically watching two colour-coded ant colonies that occasionally make a thud loud enough to remind you that even insect-hockey is a contact sport. If you want to engage all 5 senses, then you have to sit on the glass, where you you will experience many thrills and travails. For instance, no matter how many times you've been up-close-and-personal at a hockey game, you will flinch the first time the puck ricochets violently off the glass. On a similar note, there's nothing quite as exhilarating as seeing two players bounding for the boards, where they will cause a terrific crash. The subsequent quaking of the boards will never fail to make you fear an imminent downpour of glass shards. That's why I refer to this section of the arena as "the seats of Damocles." As the boards wobble violently, a giddy fear will arise: the fear that the game itself will bust through the barriers and land in a heap on top of you, thereby offering an experience that beats any 3D movie. This rare mixture of terror and glee will revive memories of playing bumper cars as a child. Indeed, hockey seems a lot like human bumper cars when watched close up. However, there are also many hazards to watch out for when taking in the game up close. For instance, the inexperienced fan may find himself or herself in a sticky state of embarrassment if he or she forgets that the rules of physics apply in hockey games. That little ledge around the glass might look like an enticing place to set one's drink, but experienced fans know that they should resist the ledge's allure and instead place their beers on the floor--no matter how varnished it may be with the syrupy remains of drinks gone by. 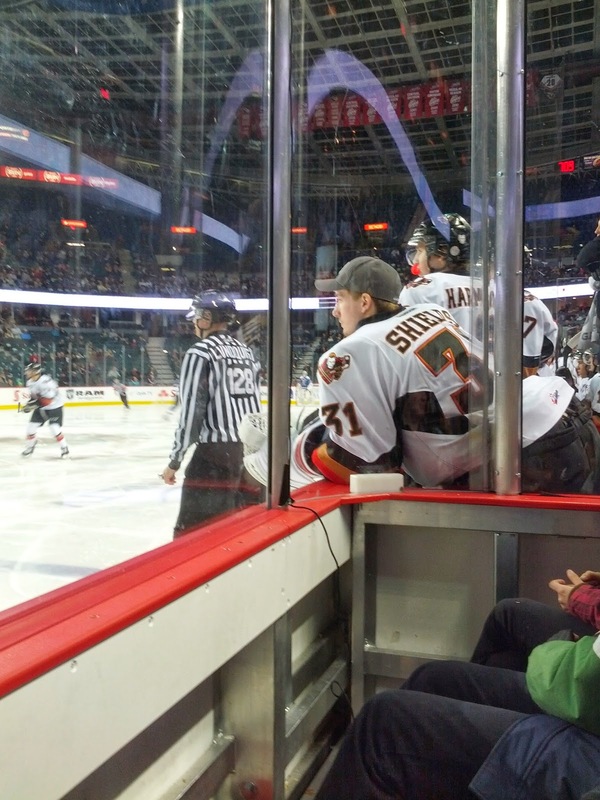 When I was at the Calgary Hitmen playoff game against the Kootenay Ice last Saturday, some patrons didn't heed this simple rule and ended up wearing their beer and ice cream after an on-ice collision sent both purchases hurtling into their hapless laps. Worse yet, they had to stifle their looks of abject surprise when their gaze met the unsympathetic sneers of fellow onlookers. Even the players responsible for the unintended concession barrage stopped their roughing long enough to take in their Jackson Pollock-esque masterpiece with mocking approval. Refraining from using the ledge as a snack repository is just one of the questions of etiquette that fans must resolve. Another involves the propriety of yelling "down in front" at the team's backup goaltender when he leans out to watch the play. Some players screen goalies; some goalies screen fans. There is, of course, one other downside to siting within close proximity of the athletes. Being close to the players' bench means being close to the players' stench. As each period wears on, you'll become accustomed to the musty yet pungent scent of wet gear, but the absence of the skaters during intermission will ruin that acclimatization. And so, with each new period, the game's assault upon each patron's nose renews with greater vigor. Hockey demands a lot from players as well as fans, and a willingness to sacrifice one's olfactory felicity is at the top of the list. Lastly, sitting close will enable a fan (in many arenas) to feel the game. At the Saddledome, most seats are--at best--a bit uncomfortable. As a matter of fact, the owners should hang a sign outside the arena that reads, "Abandon all hope of personal space, ye who enter here." The only place in the building that has adequate legroom is the area along the glass, and it has ample space. Indeed, there's even a bar at the base of the boards that can serve as a footrest. When you use that part of the boards as an ottoman, you get further into the game as you will absorb some of the collisions during the action. If nothing else, getting a feel for the game will elevate you from an "armchair General Manager" to a "Sideline Scout." And so, while sitting around does not afford the best overall game experience as you'll often rely on the screens above to see the action at the opposite end of the rink, when the play does hover around you, those seats offer by far the most immersive hockey experience.